The pet urn with photo combination is a meaningful and special way to honor and remember a faithful beloved furry companion. It's difficult to replace a pet's unconditional love. This handsome Cherry MDF Pet Photo Cremation Urn - Medium stands out from all the otherpet picture urns. So solid. Engrave a pet's name or favorite nickname on the frame that will surround an image captured during a spontaneous photo shoot " jumping for the Frisbee, napping in the sun, begging for a treat, rolling in the grass " those imploring eyes, the playful look. Store a pet's ashes in the discreet compartment. MDF is a mixture of wood and resin to give the final product many advantages. MDF is strong and resistant to warping or cracking and thus longer lasting than many other wood products. The surface of MDF is very smooth making it much easier to beautifully paint or to add veneers. Also MDF is very affordable. A regular wood urn box of this quality could easily cost several hundred dollars more. 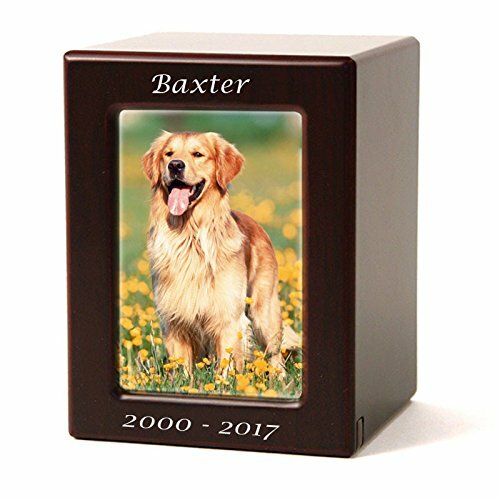 Extra large pet photo urn made of MDF with a cherry wood stain finish. Holds a 4.75"H x 3.5"W photo. Dimensions: 6.50 Inches High, 5.00 Inches Wide. Capacity: Ideal for a body weight of up to 85 pounds prior to cremation. Engraving available. Please enter B07CHYTXH6 in the Amazon search bar to find the engraving product. Provide engraving details after selecting CUSTOMIZE NOW.